The Factor-50 was needed yesterday (Tuesday) as stunning sunshine added to the good mood at the official opening of the N76 Callan Road Realignment. 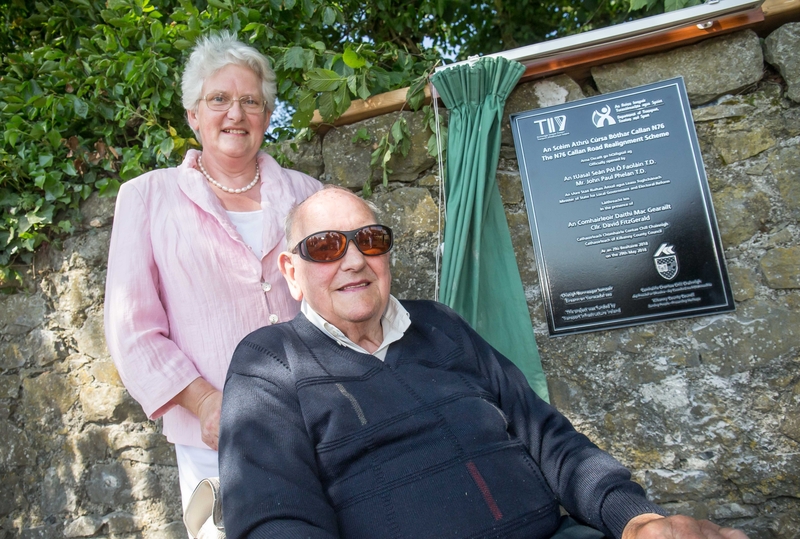 Local residents, who have sought the revamp of the road for years, turned out in force to see Minister of State John Paul Phelan unveil a plaque to mark the occasion. The improved section of road runs for 4.4km from the Callan Road roundabout on the Ring Road out to Brownstown junction near Cuffesgrange. The council says the realigned road will improve the capacity, safety, overall consistency and efficiency of the N76, providing more reliable journey times and enhance the prospect for future development and growth. “What we have here today is a safer road, a fantastic amenity and a fitting attractive entrance to our historic city of Kilkenny,” said council director of services Tim Butler. The contract for the works was awarded to SIAC Construction Ltd, and the €9.5 million funding required was provided by Transport Infrastructure Ireland (TII). Minister of State Phelan said the road had been a priority of the County Development Plan since the 1980s. “Driving out the Callan Road now is a completely new experience,” he said. “I don’t have to tell the people who drive it multiple times a day, and particularly the residents. It was an unusual stretch of national secondary road with so many entrances, so narrow at points, and just very dangerous. The scene of many serious accidents over the years. Around 9,000 vehicles use the stretch of road everyday. The scheme, which finished on time, has provided new footpaths, cycle tracks, and public lighting. It also includeds priority junctions and central ‘ghost’ islands to provide for safer turning onto local roads. The Tennypark Cross junction has also been reconfigured to eliminate the risk of road users going straight through it. Cathaoirleach David Fitzgerald said the road had been the scene of tragedy in previous years. “It was so important to realign this road, and that is because we had fatalities. Just a couple of 100m up the road from where we are, the Tennyspark Cross to Brownstown section, a number of people lost their lives,” he said. The opening was attended by council officials, contractor and sub-contractors, representatives of the TII and the Gardaí. A number of landowners were affected by the scheme in terms of land acquisition, and the council thanked them for their cooperation. “Kilkenny County Council wishes to acknowledge the co-operation and patience shown by all during this period,” said a statement from the council.